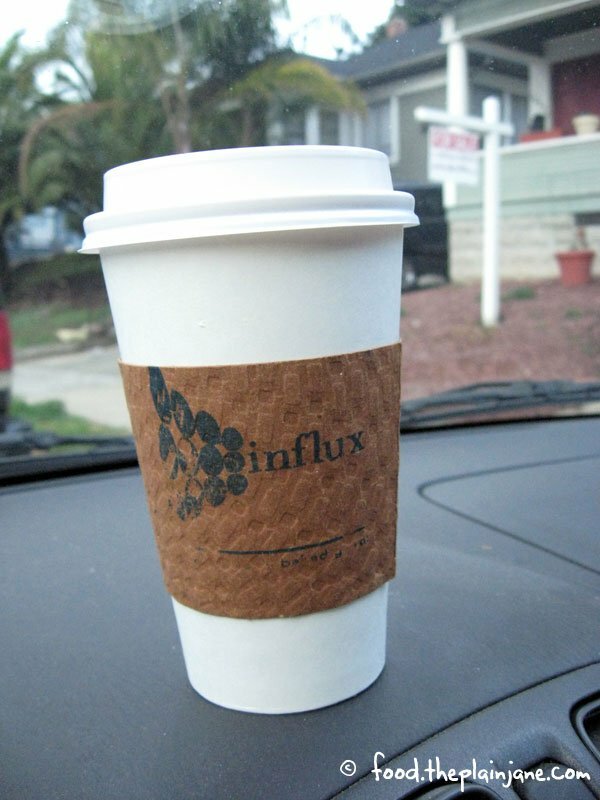 Influx Cafe is a cute little place tucked into Golden Hills. I’ve read about it tons of times but never went before. I had some time to kill last Saturday afternoon and decided that what I needed were cupcakes. I heard the ones at Influx were pretty good so I had to pay a visit and find out for myself. Influx isn’t too far down from Pizzeria Luigi’s in Golden Hills. It’s off Broadway, one of the main thoroughfares in Downtown San Diego and as I was driving down the hill I enjoyed the view down Broadway – I could see all of the way down to the bay. Too bad it’s only a mental picture now, folks, I didn’t think to snap a shot. I drove around the block looking for a parking spot – I was afraid that the sky might open up and pour rain on me again so I didn’t want to walk a bunch of blocks to get there. My continuing cough (hello, over 2 weeks now) plus a chilly, rainy afternoon was not a good combination. I snagged a 15 minute parking spot right next to the cafe and proceeded inside. The place was packed – every seat was taken with people quietly drowning themselves in a bath of computer light. There was a small line ahead of me as I eyed the menu and front case counting the cupcakes. I ended up getting a bagel snack for my lunch, a hot chocolate, and 3 cupcakes to sample later with Jake & son. I took my treats, moved my car to another spot, and ate my lunch in my car. 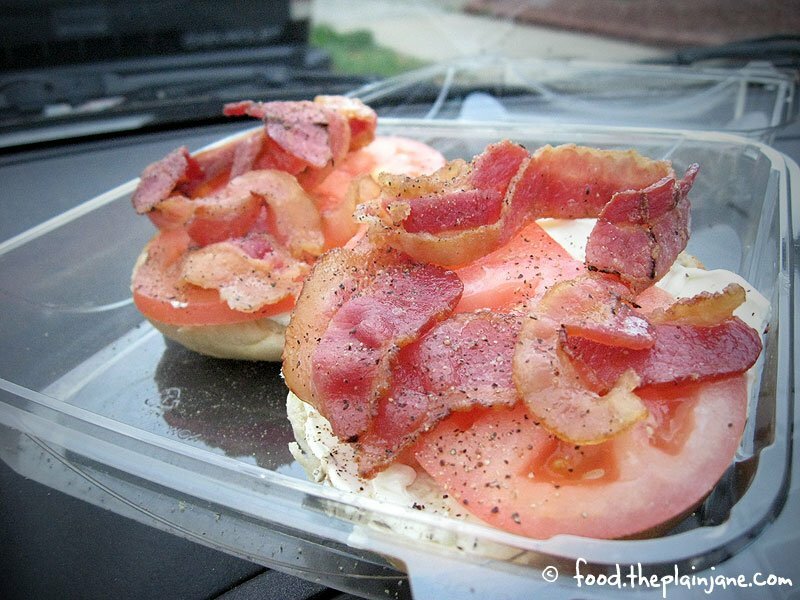 This is the “BCT” ($4.50) – bacon, cream cheese and tomato on a plain bagel. I was surprised that the bagel was open faced like this instead of smooshed together (that’s how it came to me at a different shop when I ordered a similar sandwich to this) and I liked it. You get more of everything when it’s open-faced like this. Good bagel, right amount of cream cheese, the tomato was crisp (I can’t stand soggy tomatoes at all) and the bacon cooked well. Very tasty and filling with all of the bagel-ness. They only had plain bagels left that afternoon but that was perfectly fine with me. Okay, so I didn’t pop the lid off and actually take a photo of my Hot Chocolaty drink ($2.75). Oh well. The cup sleeve heat thing (what is that thing called? A cozy?) is cute in any case. The hot chocolate hit the spot on a cold, rainy afternoon. It was a nice overall flavor – not too rich or too sweet, just the right amount of flavor. Each of the cupcakes I got was put into one of these cute Chinese takeout containers. Love it. Since I was in my car, I took photos of all of the cupcakes while they were still in the containers. 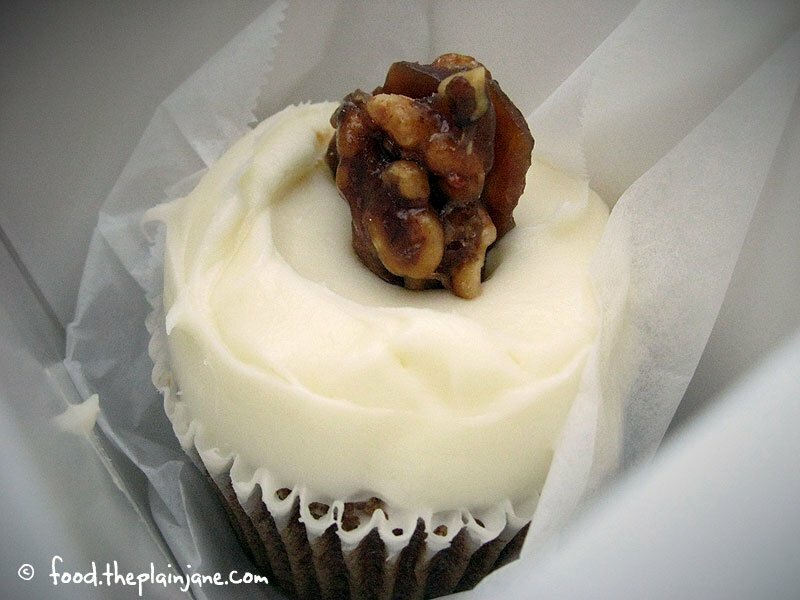 This is a photo of the Carrot Cake cupcake ($3.50). It’s got a caramelized walnut as the topper. At first I thought it was a brittle of some sort, so I was surprised when that little topper was really chewy instead of crunchy! The cupcake itself was very moist (all of them were) and had a good spice/carrot flavor. The frosting is also really good – a cream cheese frosting. Not too sweet, just right, and a fit fluffy. 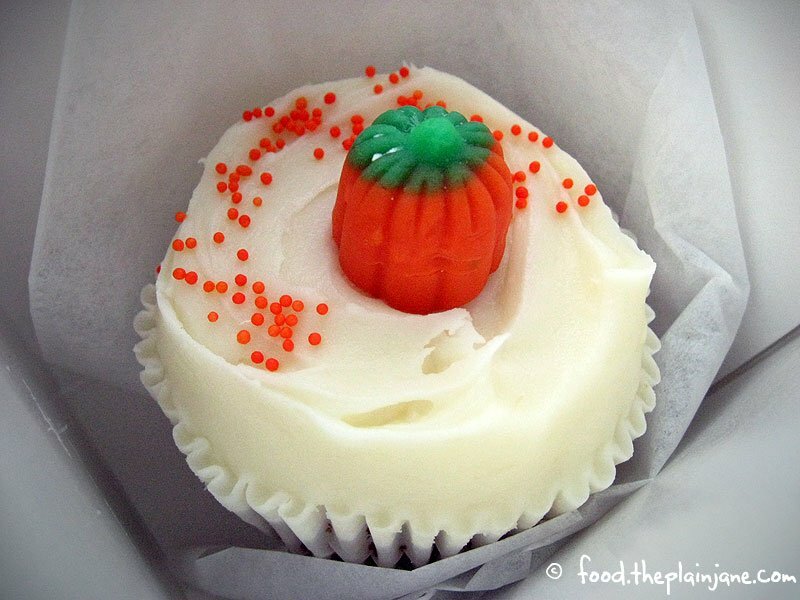 Here’s one of the seasonal flavors – a Pumpkin Cupcake. I loved the little candy pumpkin on top with the touch of orange sprinkles. So cute! I really enjoyed the flavor of this one as well – though I thought it was a bit of a mild pumpkin flavor and again very moist. This is the Red Velvet Cupcake. 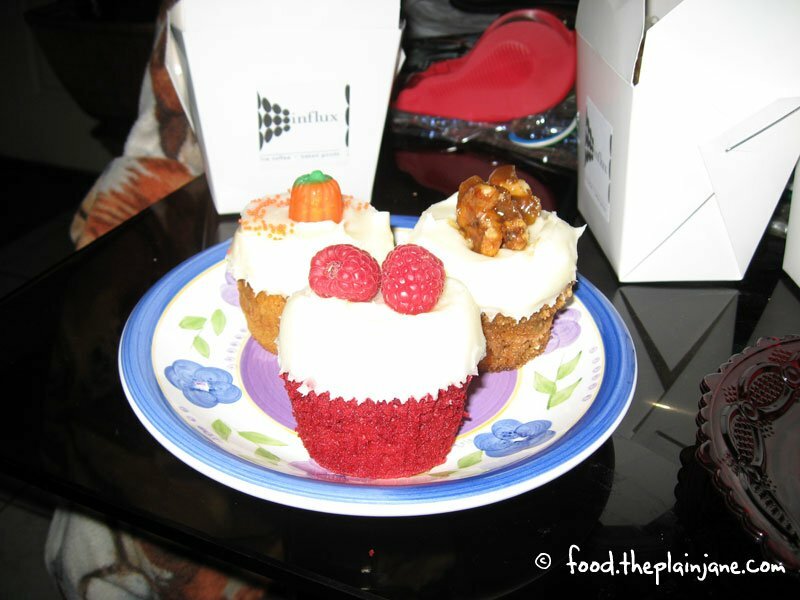 When I read reviews about this place, most people seemed to talk about the Red Velvet cupcakes more than anything else. These cupcakes have the classic red coloring to the cake, a very mild chocolate flavor and (this is the theme of the post) super moist. I liked how soft and delectable all of their cupcakes were. I think my favorite of the trio though was the pumpkin cupcake. I had split the cupcakes into quarters to share with Jake & son so everyone got 4 pieces of cupcake. I ended up having to eat the other piece of Red Velvet because Jake didn’t like it (he doesn’t really like anything chocolate) but I wasn’t sad about it. All of the cupcakes were pretty good if you ask me. Here’s a really awful, overexposed photo so you can see the color of all of the cupcakes. I was having flash issues that evening and I really wanted to eat the cupcakes so I gave up. 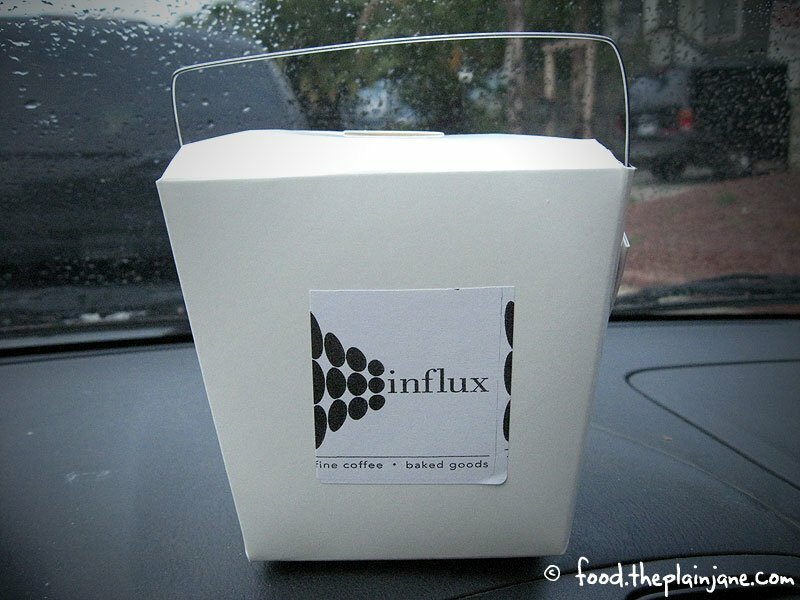 I’d like to visit Influx again and try one of their other sandwiches and other cupcake flavors (that afternoon they also had Coconut and a Chocolate cupcake). Also, free wi-fi – that’s why every seat was taken! hee hee – cc, you crack me up! i love that about food blogs too (and twitter) – learning about new places! i’ve got a little list of places i want to go, i’ve seen a few on your blog i want to check out, too! Love that cupcakes are finally coming into their own. The Golden hill area and South Park are my favorite haunts now. There is a guy in NY who has a bakery that makes only “manly” cupcakes with camouflage designs and bacon frosting. 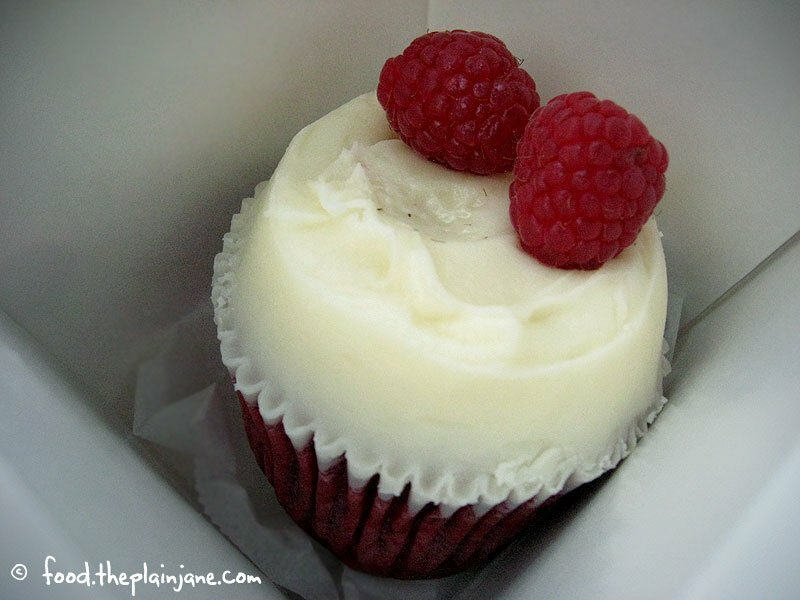 I love that cupcakes are in fine form and available at places all over town, too! There’s a business that does “Pub Cakes” – beer with cupcakes – that’s pretty “manly” (though run by women) and there’s a place in Rancho Bernarado that’s called “Batter Up! Cupcakes” – really, really good. I still want to try “Cups” in La Jolla and I’m sure there are other places I probably don’t know of yet.